Newfoundland has always depended heavily upon the sea for transportation. In the days before trains, cars, and planes, the sea acted as a highway, not as a barrier. Even today, when cars and planes are the dominant form of transportation, both Newfoundland and Labrador are dependent on the sea for the movement of most goods. 32. (1) Canada will maintain in accordance with the traffic offering a freight and passenger steamship service between North Sydney and Port aux Basques, which, on completion of a motor highway between Corner Brook and Port aux Basques, will include suitable provision for the carriage of motor vehicles. As the government agency responsible for most transportation services, Canadian National Railways inherited the Newfoundland transportation system, including the ferries and coastal boats. CN was already running ferries between PEI and New Brunswick, and would later take over routes between Nova Scotia and New England. 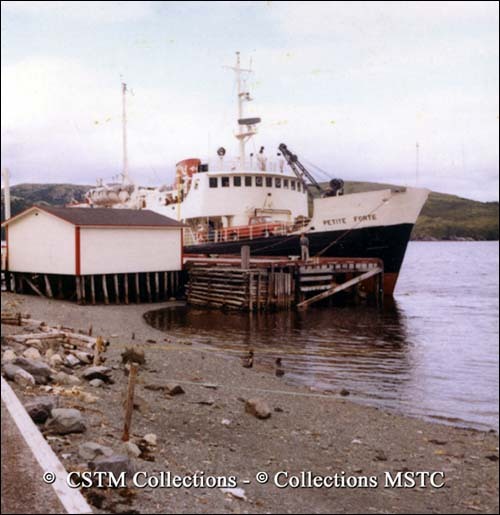 In 1949, CN became the owner of Burgeo, Baccalieu, Northern Ranger, Springdale, and Bar Haven, boats which shared the coastal services. The Cabot Strait, as its name implies, was responsible for the Gulf run to Nova Scotia. The last two ships of the famous, yet aging Alphabet Fleet, Glencoe and Kyle, also remained in coastal service, as did three small freighters. CN intended to build more vessels, but first purchased three of the “Splinter Fleet” (wooden vessels built in Clarenville during World War II) as a stopgap measure. These were the Burin, Clarenville, and Codroy. Confederation removed trade and travel barriers between Newfoundland and Canada, and demand for coastal and ferry services grew steadily in the early 1950s. A car ferry was badly needed, and CN commissioned the William Carson in 1955. Built at the Canadian Vickers shipyard in Montreal, it became both the first Canadian-built ship in the Newfoundland service, and the first ferry able to carry tourists and visitors to the island along with their cars. 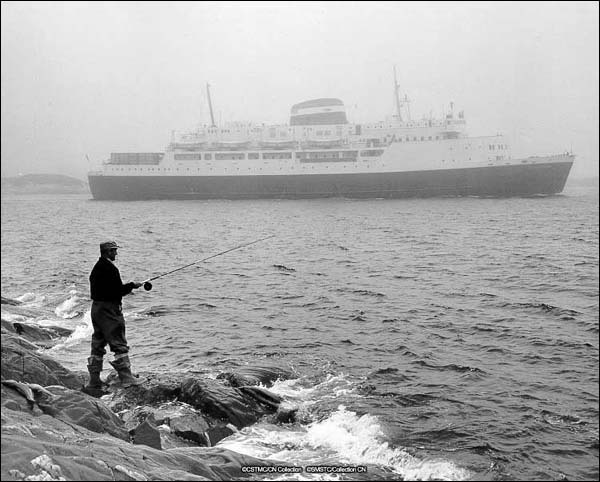 Ferry MV William Carson with fisherman in foreground at Channel–Port aux Basques, NL, May 1959. Photo by G.R. From the CSTMC/CN Collection. Image No. CN001576. Courtesy of the Canada Science and Technology Museum. CN continued to improve the fleet, replacing the Glencoe and the Codroy with the motor vessels Bonavista and Nonia in 1956. The Hopedale was added in 1960, and the Taverner and Petite Forte in 1962. These vessels were largely responsible for coastal and Labrador work. The Trans-Canada Highway was completed across the island in 1965, and the Leif Eiriksson joined the fleet to handle extra ferry traffic on the Gulf for the 1966 Come Home Year celebrations. The railcar ferry Patrick Morris, purchased in 1965, was used as a freighter before being converted back into a railcar ferry in 1968. That year, another railcar ferry, Frederick Carter was added along with the car/passenger ferry Ambrose Shea. 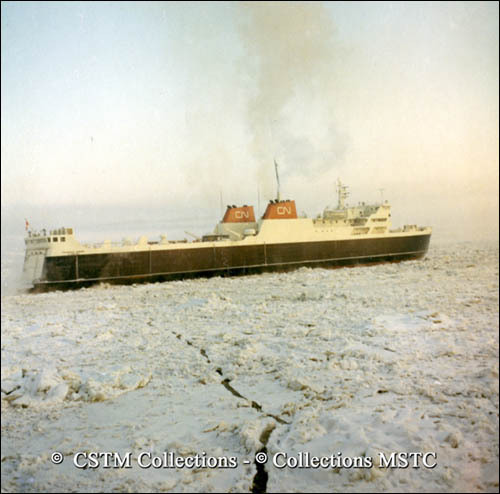 MV Frederick Carter on its maiden voyage from Quebec City to NL, January 1968. Railcars would be loaded through the large stern doors. Photo by F. Lortie. From the CSTMC/CN Collection. Image No. CN007167. Courtesy of the Canada Science and Technology Museum. The Ambrose Shea joined the Carson and the Eiriksson as the main passenger/automobile carriers on the Gulf run, while the Frederick Carter and Patrick Morris handled railway freight. These two railcar ferries were intended to improve the movement of freight between Newfoundland and the mainland, which was complicated by Newfoundland's narrow-gauge railway system. Previously freight was unloaded from railcars in Nova Scotia, carried across the Gulf by ship, and then loaded into railcars again. The Carter and Morris could carry the full railway cars themselves to the island. Train ferry MV Patrick Morris on a trial run, Sorel, Québec, 27 Apr. 1965. Note the flat stern, where the loading doors for railway cars were located. Photo by L. Monk. From the CSTMC/CN Collection. Image No. CN001698. Courtesy of the Canada Science and Technology Museum. The ships launched in the 1960s became the mainstay of the CN fleet, as older ships were retired. The Northern Ranger was sold as scrap in 1967, and the Burgeo and Baccalieu followed in 1969. Bar Haven and Springdale went to the wrecking yards in 1974. CN also lost two newer vessels. On the morning of 20 April, 1970, while answering a distress call from a fishing vessel, the Patrick Morris sank when heavy seas caved in her stern loading doors and flooded the ship. The captain and three engineers died, but 47 other crew members were rescued. Then, in June 1977, the William Carson was damaged by ice and sank. She had just been transferred to the Labrador run, in response to a growing need for passenger and freight services to the Labrador coast. All of her 29 crew and 129 passengers were rescued. Tug Koral towing the Springdale and Bar Haven out of St. John's heading for Spain to be scrapped. Reproduced by the permission of the Maritime History Archive (PF-001.1-B02), Memorial University, St. John's, NL. By 1977, transportation in the province had changed substantially. The Trans-Canada Highway was complete, the passenger rail service was gone, and roads had reached many formerly isolated communities. Cars and trucks were now the dominant means of transportation, and CN had to adapt to changing and growing demands. For example, when launched, the William Carson could carry 262 passengers, 58 cars, 6 trucks, and 600 tons of cargo, including 25 head of cattle. When it sank, it had been modified to carry 110 cars and trucks and 500 passengers. The resettlement programs of the 1950s and 60s had emptied hundreds of small outport communities that previously depended on coastal boats. Most freight was still moved by water, but demand for coastal passenger service was dropping. To deal with these changes, and to separate the subsidized and revenue-losing ferry and coastal operations from the CNR mainline rail business, CN Marine was created as a separate operating division in 1977. MV Petite Forte unloading cargo at Hermitage on the south coast of Newfoundland, August 1970. Note the pickup truck on the deck. Photo by D.S. From the CSTMC/CN Collection. Image No. CN007190. Courtesy of the Canada Science and Technology Museum. 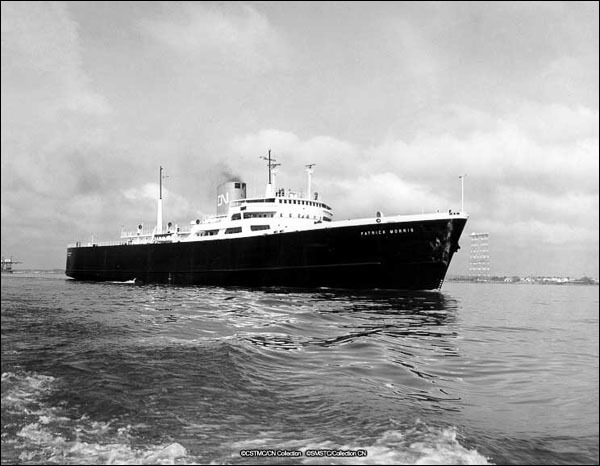 There were then seven vessels on the Gulf run, the Ambrose Shea, Frederick Carter, Sir Robert Bond, Marine Cruiser, Marine Nautica, Marine Atlantica, and Stena Nordica. These last four were chartered or purchased from other countries. Vessels like the Bonavista, Nonia, Hopedale, Petite Forte, and Taverner continued to work the coastal and Labrador routes. The Marine Sprinter and Marine Runner were added to the south coast routes in 1975. These two small, fast vessels moved passengers between Port aux Basques and Ramea. The Marine Sprinter carried 66 passengers but no automobiles. From the Harold L. Lake Photograph Collection. Reproduced by the permission of the Maritime History Archive (PF-312.122), Memorial University, St. John's, NL. Many of these ships were ferries, capable of carrying a mix of passengers, automobiles, and especially tractor trailers across the Gulf. Trailer traffic was quickly becoming more important, and was one of the main reasons why the Carson and Eiriksson were replaced on the Gulf run by the three chartered Stena Line vessels from Norway (Nautica, Atlantica, and Nordica). These vessels allowed the crossing of 28,000 tractor trailers in 1976, compared with 2,000 in 1971. In 1986, the separation between rail and water services was made absolute. CN was preparing to end railway operations in Newfoundland, and CN Marine became a separate crown corporation called Marine Atlantic, which was originally mandated to operate the Gulf ferry service and the few remaining coastal routes (mainly on the south and Labrador coasts). Marine Atlantic added two new superferries, the Caribou and the Joseph and Clara Smallwood. Two of the largest ferries operating in North America, they became the mainstay of the Gulf fleet, and replaced several older vessels. Budget cuts during the 1990s strained Marine Atlantic's services, and the 1997 opening of the Confederation Bridge eliminated a large chunk of its business between PEI and New Brunswick That year, in a deal echoing the “Roads for Rails” agreement of 1988, the Newfoundland government took over responsibility for the coastal routes in exchange for federal money to improve roads to isolated communities in Labrador. 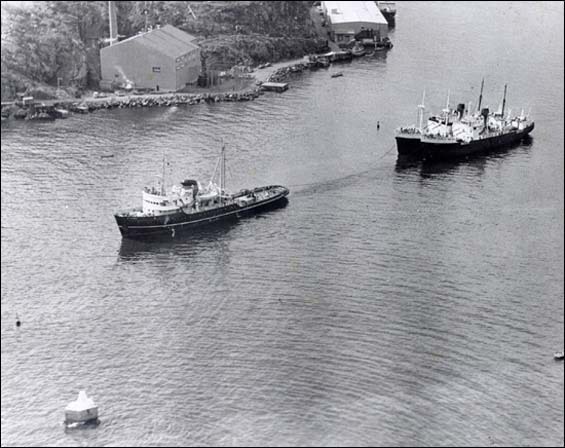 Marine Atlantic was now responsible only for the Port aux Basques-North Sydney and Argentia-North Sydney routes. The provincial government operates several small ferries on the south coast, and Labrador Marine Inc., a private operator, took over the Labrador runs in 1998. 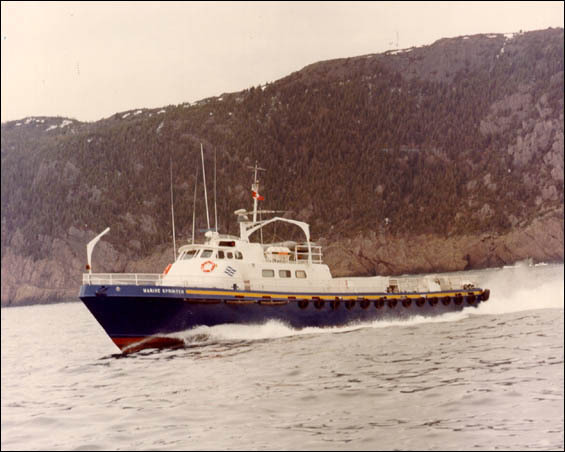 As of 2010, Labrador Marine is operating the Apollo, Northern Ranger, Sir Robert Bond and Astron on various Labrador routes. Transportation requirements in Newfoundland and Labrador continue to change. The residents of Grand Bruit, one of the few remaining communities on the south coast still serviced by coastal boat, decided to relocate in 2009, reducing the need for coastal services in the area. Freight services are now largely handled by private companies such as Oceanex, which runs cargo vessels from Montreal and Halifax to Corner Brook and St. John's. Many more ships than those mentioned here have served in the coastal or ferry service in Newfoundland and Labrador. Some were chartered for a short time; some were CNR and CN Marine vessels that normally worked the Northumberland Strait or Bay of Fundy. These vessels filled gaps or provided short term relief when other ships were unavailable. Transportation requirements are constantly changing, and although Marine Atlantic is now only responsible for the Gulf run, it continues to modify its fleet, adding another Leif Erikson in 2001 and the Atlantic Vision in 2008. In 2010, Marine Atlantic announced plans to charter two new ferries from the Stena Line. These ferries, the MV Blue Puttees and the MV Highlanders, replaced the aging Caribou and Smallwood, and maintain Newfoundland and Labrador's constitutionally-guaranteed link to mainland Canada.